It is THE election story of the night. Not just in London but across the country. A Council which has been in power for 28 years manages to persuade its electorate to allow it four more years and increase its majority. You'll agree that's pretty special now add the words Liberal Democrat into that sentence and you can see why this story soars straight to the top of the premier league. Currently that party is close to losing 100 seats is about 13% down in votes and is neighbour the Liberal Democratic run Kingston Council - which has just conceded defeat to the Conservatives. Whichever way you look at it the Lib Dems have run an incredibly successful campaign having run a very successful council. That's not my view it is the view of the thousands of people who voted for them - because this was their chance to say otherwise. They had UKIP to turn to, a Labour party which elsewhere in London was making gains and a Conservative party which had four years to plan their campaign - but they chose the Liberal Democrats. They trusted them to steer our borough through what is likely to be a very difficult period. I have nothing but admiration for their skill in this achievement. As every team knows it is much easier to attack than defend - but defend they did and won handsomely. There is now a lot of new blood but also more long standing councillors who can guide their new colleagues through the "excitements" of local political life. It was a great result for them but actually it was a great result for us all because after 10 hours of being in Westcroft there was every fear that we were never going to get out! How about a Friday day count next time chaps - I will be four years older. I tweeted in slight mockery that Mr Clegg should visit Sutton as soon as possible to try and understand how to win elections. But it is true actually where else would you go if you wanted to see Liberal Democrat success and wanted that success emulated in other parts of the country. Remember this wasn't part of a council this was the whole 50 and more seats up for grabs. I look forward to his visit. The Liberal Democrats have won control in Sutton Council local elections after winning 45 of the borough’s 54 seats. Second were the Conservatives with nine councillors elected. No other parties won seats. The Liberal Democrats success was confirmed at 8am today after 200 staff counted the contents of ballot boxes from 61 polling stations. A political party needs 28 councillors to assume control and run the council, directing its policies and actions over the next four years. A total of 208 candidates from 10 political parties contested the election. The London Borough of Sutton is divided into 18 wards, with three councillors on each – making 54 councillors in total. The three main parties, the Conservatives, Labour and the Liberal Democrats, had contested all the seats – with each fielding 54 candidates. The United Kingdom Independence Party (UKIP) fielded 19 candidates, Green Party 16 candidates, Trade Union and Socialist Coalition 4, Keep Our St a Helier Hospital Party 4, English Democrats 1, Christian Peoples Alliance 1 and one independent candidate. Turnout was 42.2 per cent – compared to the 70 per cent in the previous local election (which was combined with a Parliamentary Election) in 2010. The number of postal votes requested went up from 25,225 in 2010 to 23,690 this year. At the annual council meeting on 9 June, 2014, the new mayor will be elected and the Liberal Democrats will announce who the Council Leader will be. In the interim, Chief Executive Niall Bolger will use delegated responsibilities to lead the authority. UKIP surge: Will it hit Sutton but what will the impact be? As the results mount up there is no doubt that UKIP are making an impact. But how will they effect the Sutton election results? Currently it appears that the Conservatives across the country are suffering at the hands of the new UKIP voters. If that happens in Sutton then there will certainly be a different complexion to the council. But as important will the Lib Dem vote hold up against such a surge. The count is well underway and so we will know very soon. Former Lib Dem MP has said that he will initiate party procedures to remove Nick Clegg as leader of the Liberal Democrats if they get six or fewer European Parliament seats. The Lib Dems currently have 11 but Opik is predicting a big loss influenced by UKIP. He has, however, told the Sutton Guardian he will back Clegg "all the way" if they get more than 10 seats. Will the Wrythe ward predict the balance of Sutton Council? Which is the ward that will offer the best indication of the result? Well according to sources it is The Wrythe ward. The ward has two long-standing candidates not standing and according to some, is the bell weather as to what is going to happen tonight. The leading candidate last election was a Lib Dem who achieved more than 1,000 votes than the fourth place person. That was a Conservative with Labour almost 2,000 votes behind the first person. There was no UKIP last time but there is now - so we really will see the impact of the party. So perhaps all those in the know are right? Carshalton and Wallington&apos;s Liberal Democrat MP Tom Brake has spoken of his hopes for the Lib Dems for the night ahead. "We&apos;ve been doing box counts and wards like the Wrythe, which is one of our strongest wards, and we&apos;re coming up substantially ahead but box counts aren&apos;t scientific, you&apos;re just looking at the ballot papers as they come out. It&apos;s a guesstimate but it&apos;s enough to know it looks good. Carshalton South and Clockhouse looks closer and Carshalton Central is going to be very hard fought," Mr Brake told the Sutton Guardian. Perhaps Belmont ward will be the place to really test UKIP strength? Currently there are three Conservatives in the ward with the third Conservative councillor polling 2,355 votes. The fourth place a Liberal Democrat polled just 123 votes less. UKIP polled 621 votes - could any upsurge in that vote damage this Conservative stronghold and loss valuable seats for the Conservatives? Also just heard that the long serving councillor Peter Geiringer isn't standing this time - which is strange bearing in mind the challenge facing the Conservatives. Former MP and I'm a Celebrity Star Lembit Opik has been spotted at Sutton Election count. The former Liberal Democrat MP has appeared at Westcroft Centre - and now the question is why? Everyone appears to be pleased to see him - he has even agreed to pose for photographs. We'll watch him with interest. Great story from the election is about an elderly couple who wanted to vote and along came the meals on wheels provider who not only gave them great food but provided them with even greater help. Lots of questions to be answered tonight - going to highlight a few of them before the first count is announced. The first sits in Beddington. Just what impact will the incinerator have to the vote in that area? Interestingly the Lib Dem councillor who moved across to Labour is no longer standing in that area. Not sure what that says - but I reckon we will find out tonight. Here we go Sutton elections and the tea ladies are ready! Well the Sutton Voice team are in! It's raining outside but inside the police are in place and everyone in Westcroft is waiting for the first boxes. Could be a long night as the the ladies have been told they will need to be at their station till 6am! With 90 minutes to go - the end is drawing close. But is it close enough for anyone to come up with a prediction as to the outcome of the Sutton elections? All day I have spoken to people, monitored the social media and as probably in every election ever fought - no one is really prepared to stick their neck out. So I will. There may be fewer Liberal Democrats than were elected to the council in 2010, there will be some very close results but personalities and hard work will, however, I believe allow many councillors to buck national trends. In short they will have earned their votes through consistent hard work. The UKIP effect will inevitably have an impact but speaking to various people they all disagree as to what that impact will be. The key parties have said that they will lose votes to UKIP - they can't all be right or can they? Is anyone out there prepared to make any predictions? For many devoted party members this must be a tough time. They will probably be pretty tired already. Starting "work" at the crack of dawn and now looking down the barrel of another potential eight or nine hours of effort before the results of the local elections in Sutton Borough are known. But to make it all worth it they have to gird up their loins and hunt down every last vote. I visited several polling stations today and everybody says "its going to be close." Sadly no one can give me who it is going to be close between because there appears to be very many theories circulating. Will UKIP impact, will the personalities of local councillors who are seeking election again be enough, what about the change in the number of sitting councillors who are not seeking re-election? So many questions. Well guys one final push because it won't be long before we know the answer. It would be wrong to think that there are just the main parties in the Sutton elections this year. Perhaps the largest of the "other" parties is the KOSHH Party. This group is focused on the issues surrounding St Helier Hospital and have used the elections as part of their campaign to try to maintain pressure on all those who have the responsibility to keep the Hospital offering all of its current services. Interestingly other parties have clearly had Saving St Helier as a central plank especially in the Northern Wards - but this group have chosen to strike out on their own. Views on such groups vary. They may dilute votes, they may heighten awareness but for me it is another group of people engaging in the democratic process. This is no lightweight undertaking for they have had to find candidates, canvass and generate awareness. They are to be congratulated for taking this level of interest. The power of digital media never ceases to amaze me. There I Here I am just an hour ago mentioning that there is an 18 year old man who is standing for election in Sutton and now it is pointed out - quite correctly that Millie Shields who is standing for the Conservative Party in Sutton North was 18 just in April. So it looks as if there is still a generation of young people - as I suspect there always is - who want to be involved in deciding what is as much their future as anyone else. To be able to have this "conversation" with so many people so keenly involved in the events of today is a privilege. Thunder, lightening, hail - nothing will stop Sutton voters? Okay now this is a testing time for all lovers of local democracy. Candidate Tim Crowley has just described it as "the first part of the apocalypse....." might not be that bad but from where I'm sitting it is going to be hard for all the committed and dedicated people to keep their spirits up. The various party vote recorders I hope have packed up their deck chairs, the local authority staff may well need to get out their crosswords because these appalling weather conditions certainly don't look like shifting too soon. Just this morning there were various messages hoping the weather would be fine - well it started okay. Here's hoping that this is a passing shower and we can get back to the climactic encouragement that we all need to get out and vote. Postal voters are currently grasping their nice hot mugs of tea or coffee and smiling inwardly. Sutton has always been blessed with a vast majority hard working and committed councillors - no matter what party. But inevitably they are people who find themselves with what they believe to be the time, the experience and the passion on issues that make them feel able to contribute. This does tend to lead to a heavier balance of the older age groups on this and any other elected chamber. Now I don't want to stop anyone for seeking to represent us which is exactly why I was so heartened this morning to find that we have one candidate who is 18 and wishes to be a councillor. The man's name is Alex Vincente-Machado and he is standing for the Liberal Democrats in the Carshalton South and Clockhouse ward. Any organisation is better if it can get the best possible cross section of opinion and experience. Well done Alex. If any other party has a candidate of the same age or younger just let me know and I will happily mention them. How will social media impact in this election? Well I have been monitoring since too early this morning and every party is on the Twitter feed wishing others’ luck and also still rebutting information that has been published pre-voting day. Sutton Voice has been established on the “back of” social media and so it will be particularly fascinating to see just how much influence the key players on this part of so called "new" media fair when the ballot boxes are finally closed. Candidates from all parties have been vigorous in their comments – but inevitably they only probably serve to re-inforce the vote of the “followers” that they have. Or do they? I have noticed that new candidates have used Twitter to express opinions locally but also a random assortment of views. Perhaps discipline and focus is needed - but some may like to know the whole character of a candidate. Increasingly this is a new constituency which needs to be worked and the lessons of this election will I am sure be learned and developed for future events – not least the general election next year. Looks like turnout could be between 35% and 40% in the local election today. Speaking to a polling station very early on the traffic had been good but not brisk. 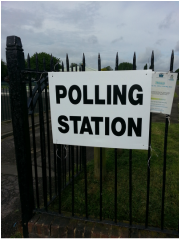 Here's hoping that everyone who has the opportunity to vote does so - remember you can do it after tea as the polling stations don't close until 10pm. The elections will have a very different look this year turnout wise – because last time it was also a general election and the turnout was nearly 70%. The keen polster who was already marking off the voters who were prepared to share their card numbers with him said that it was difficult to say the impact that falling on the same day as the Euro elections would have. Remember the excitement is only really beginning when every ballot box is closed and sealed and taken to to Westcroft Sports Centre to find out just how it will all pan out. Just in case you don’t know what you are looking for here’s a sign. If you aren’t sure where to vote everyone should have received a polling card which tells them clearly where they have to go and usually they aren’t very far from your door. Most of the parties will offer help to get you to the polling station so if you aren’t able to make the journey just let me know and I will make sure I find someone who can help you. Well today is the day – its local election day. It's Sutton’s chance to shape Sutton for the next four years. As everything from schools halls, church hall, scout halls open up – all we can hope is that as many people as possible take the glorious opportunity to express their feelings through the ballot box.Of course there is the postal vote which more and more people appear to be happy to use – but I am old school. I love the walk to the polling station, my card in my hand. The moment that you offer up the card and the official search for your name on the seemingly endless list brings me a real sense of pleasure and pride. I don’t really do football teams, model railways or fishing but local government is one of my “things”. Once the list is checked – I am. I am legitimately able to take part in a glorious process. It may not work for some people but it works for me. Once you get given your “paper” it’s that moment of choice. The pencil, which is usually on a piece of string, makes a glorious slightly scrapping sound as you put your “x” in the box you choose. If you are bored today – go around to your friends and just ask “have you voted”. If they haven’t try and persuade them to do so. It’s all everyone can do. My admiration for all those who have committed to offer themselves for selection through this process is unbounded – so the very best to everyone and see you at the count! If you can’t then we will try and keep you as up to date as possible. What is the point of local elections? “They don’t really matter,” you can hear people say – well there is every point. The London Borough of Sutton is a massive business which is under great strain with continuous pressure from the central coalition government on its finances. Whoever takes charge in the coming days will face a significant challenge to make sure that the highest standard of services are maintained and it is inevitable that serious and difficult decisions will have to be taken. It is likely that the next four years will see a significant change in the role of the local authority from its usual role as a provider of services and to achieve this transfer will require a deftness of touch, imagination and complete commitment to ensuring this excellent borough and its residents do not suffer. Worcester Park ward: Who are the candidates? Wandle Valley ward: Who are the candidates? Wallington South ward: Who are the candidates? Sutton is a great place to live and this website is dedicated to showing all who enter just how much there is that is good about this London borough. This is a not for profit web site dedicated to everyone who plays their part in the fabric of the borough and everyone who wants to know what's going on or how they can help.